“Erastus in return for his aedileship laid (the pavement) at his own expense.” Click on Image to Enlarge and/or Download (free). 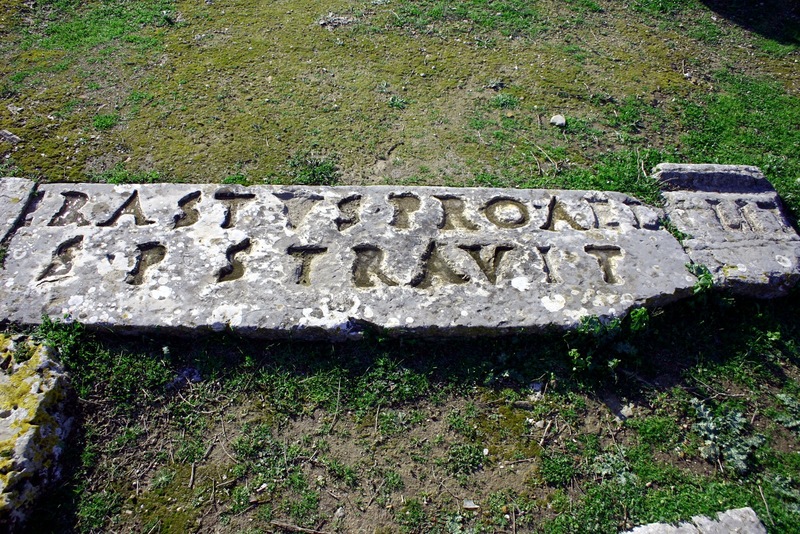 Part of a pavement found near the theater of Corinth which mentions “Erastus” who was the aedile of the city. An “aedile” was in charge of the financial matters of the city — and was very wealthy. The pavement was laid about A.D. 50. The New Testament book of Romans was written by Paul from Corinth to the church in Rome in the spring of A.D. 57—on his third journey. In Romans 16:23 Paul says that “Erastus, the city treasurer [Ἕραστος ὸ οἰκονόμς] greets you . . . .” It is very probable that the “Erastus” mentioned in Romans is the very same person who is mentioned in this inscription. Acts 19:22 He sent two of his helpers, Timothy and Erastus, to Macedonia, while he stayed in the province of Asia [at Ephesus] a little longer. For an extensive discussion of this inscription and the various options that the various Latin and (NT) Greek terms suggest, see John McRay Archaeology and the New Testament. Grand Rapids, MI: Baker, 1991: 331–33. To examine or purchase Click Here. This entry was posted in Artifacts, New Testament, Places in Greece and tagged Erastus, Latin Inscriptions, New Testament. Bookmark the permalink.